Sarah Swanson, business major, removes her back pack from one of the lockers located just outside the Testing Center in the Main building. By December the long line of students waiting to take tests in the Testing Center could be a thing of the past. The Testing Center is anticipating the arrival of 24 new lockers available to students using the center. Most of the time, the reason for the long wait at the Testing Center is due to waiting for a locker, said Jim Ellis, Testing and Assessment Services director. Students put all their personal belongings in lockers because they are not allowed to bring them into the Testing Center. 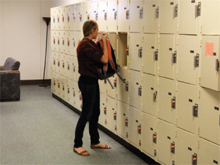 Ellis said many students take their tests before, after or between classes and have no other place to put their personal items while in the Testing Center, and the lockers provide a safe location for the students to store their things. “It’s the responsibility of the staff to keep the students safe and make sure there is no cheating while in the Testing Center,” Ellis said. “That’s why it’s mandatory for students to put all personal items in the lockers. “Students feel safer having their personal items locked inside instead of keeping them in their car,” Ellis said. The center currently has a total of 64 lockers. The addition of 24 lockers will give them 88 lockers total. The projected date for the new lockers to be available is Dec. 1. “The new lockers will be located next to the existing lockers along the wall entering the Testing Center,” Ellis said. The lockers will be free to use. Ellis said students will still need to get coins from the staff in the Testing Center for the lockers. He said the lockers are only for students to lock up their belongings while using the Testing Center. Each morning the lockers are checked and any items left behind are removed. The busiest times in the Testing Center are during mid-terms and finals weeks. With the expansion of the number of lockers at the Testing Center this winter, Ellis said, he hopes students will find shorter lines when they come to take a testing during finals week.